Are you looking for the Perfect Turkey Sandwich recipe? If anyone knows turkey, it’s Paula Deen and her two boys. I got my hands on their Perfect Turkey Sandwich recipe and thought I’d pass it along so you can store it for the end of the month! Brush one side of each slice of bread. Spread basil mayonnaise on the opposite side of each slice. Top four of the slices of bread (olive oil side down) with chicken. 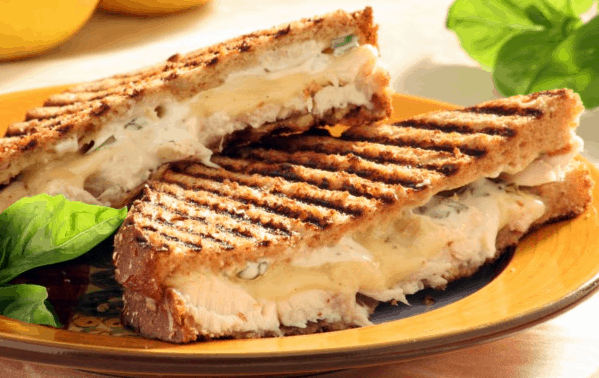 Add two slices of cheese over chicken and top with remaining four pieces of bread (olive oil side up). omg that looks and sounds YUM! And now i”m starving. LOL!